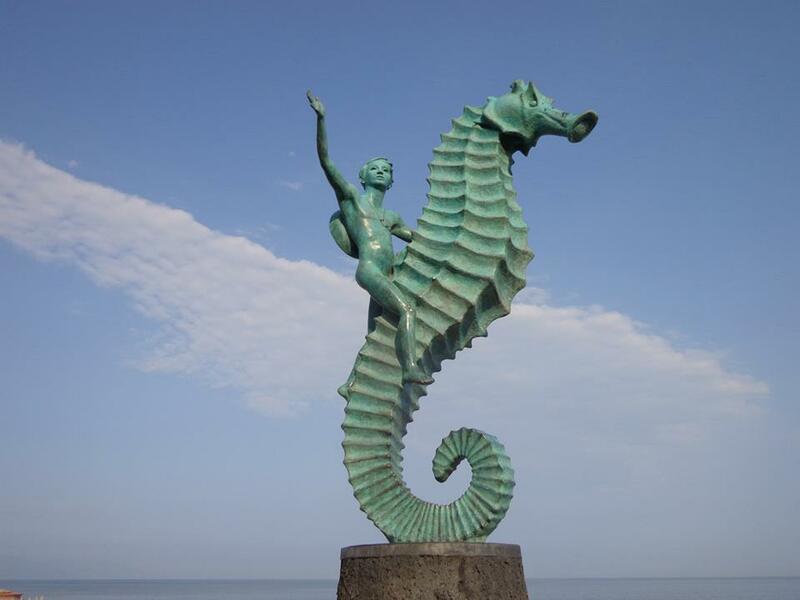 Visit Puerto Vallarta and enjoy an ocean-front walk along the city’s Malecon. View this beloved PV icon: Caballero Del Mar. Puerto Vallarta is a gorgeous beach resort city that lies along the Pacific Coast of Mexico, within the heart of U-shaped Banderas Bay where the states of Jalisco and Nayarit meet. The Ameca River is the dividing point between the two states. Formerly a colonial port town, Puerto Vallarta is located in the state of Jalisco, and its state capital is Guadalajara. Locals, expats and frequent visitors often refer to Puerto Vallarta as simply Vallarta or PV. The heart of Puerto Vallarta is vibrant and colorful, filled with the area’s rich heritage and simple splendor. Visitors are greeted by quaint and modest handmade adobe-brick houses, as well as colonial-style buildings, primarily whitewashed stucco with orange tiled roofs. Lining the city’s narrow, winding cobblestone streets are an incredible variety of boutiques, art galleries, restaurants, bars, shops and vendors. Take a stroll along Puerto Vallarta’s picturesque Malecon, the city’s one-mile oceanfront boardwalk that hugs the beach as it follows the main street in downtown PV. Throughout the Banderas Bay area you will experience the merging of traditional culture with modern conveniences. Here you will discover some of the last remaining beach towns in Mexico that have retained their historic old-town colonial feel while offering top-notch resort accommodations and modern amenities. The area boasts several state-of-the-art movie theaters, upscale shopping malls, Costco, two Sam’s Clubs, several Super Walmarts, a Home Depot, plenty of Starbucks coffee houses and many other American restaurant franchises. Additional amenities in Puerto Vallarta include high-speed internet, satellite TV, several U.S. newspapers and magazines, as well as a variety of other English-language publications. It’s easy and fun to integrate into the fun and laid-back Puerto Vallarta lifestyle. Simply walk its colorful and historic streets, mingle with other visitors, and strike up interesting conversations with locals. We encourage you to reach out and engage with rhythm of life in this beautiful, enchanting city. Those who visit Puerto Vallarta make memories that last a lifetime. And for mobile users, you can also find us on Instagram.